Yep…you read that right. And my roommate and I were just fortunate enough to stumble across this at a little fair in Louisville that highlighted local businesses. One of the businesses participating was Morels The Vegan Butcher. And on their table they had these little pouches that caught my eye. Yep…I spotted them. I also noticed that not only were they labeled vegan, but they were also gluten-free. Now you really had my attention. Morels the Vegan Butcher began as a food truck in 2011 and quickly expanded across the country when they developed their line of vegan jerky in 2012. Only using premium ingredients, this Louisville, Kentucky company handcrafts their jerky in small batches. What this does is ensure that the texture and taste remain up to standard. Morels focuses on providing nutritious on-the-go products for people looking to keep meat and dairy out of their diets. This is definitely a product that spoke to me. Trust me…I was ready to try one of the samples. So…I did…and that was all it took. A pouch of Morels The Vegan Butcher’s Ned’s Spicy Chipotle Jerky came home with me that day. I purchased it at the buy local fair and never looked back. After buying it, I commented to my roomie that it would be the perfect snack to take in the car as we travel up to Utica, New York. I was running up there and we were driving a long way to get to that race. Healthy snacks in the car are always a welcome thing. Always! So, when the stomach rumblies hit us too late for lunch but too early for dinner (we were eating out for dinner), I reached into the little red duffel of snacks and good stuff and removed the silver pouch that held Ned’s Spicy Chipotle Jerky. I already knew I was going to like it. No, it wasn’t based off of the fact that it was spicy. This was the version I sampled at the fair. So, I knew what I was doing when I bought it. 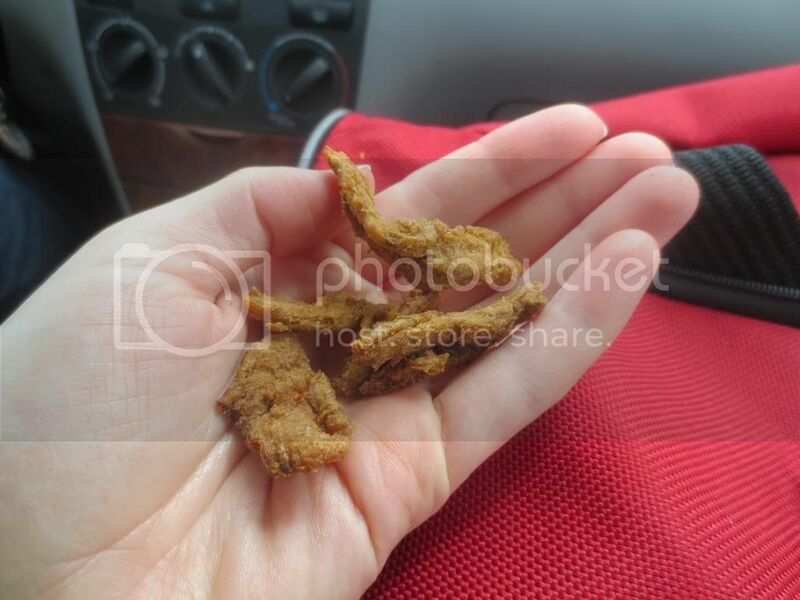 Morels vegan jerky is crated using a base that begins with marinated soy curls. By marinating these soy curls, they achieve tender, chewy, and flavorful snacks. All they do is season them up for the flavor of jerky they are creating. In the case of Ned’s Spicy Chipotle Jerky, in addition to soy curls, you have water, Braggs liquid aminos, brown sugar, olive oil, lime juice, lemon juice ketchup (no high fructose corn syrup), vinegar, liquid smoke, garlic powder, chipotle powder, ancho powder, onion powder, pepper, cloves and nutmeg. Nothing fake. And…these snacks are gluten-free and loaded with protein…making them a fantastic choice for a gluten-free, vegetarian athlete like me. But…how can something that is created by marinating soy curls taste? How about really damn good! Oh yes…this jerky is spicy and addictive. The blend of chipotle and ancho chile powders really get a nice heat going with each bite that you take. Nothing that overpowers, mind you, but just adds a little flavor and a little heat to each bite. I loved the chewy, soft texture of this jerky. And the flavor was smokey and spicy and just amazing. Honestly. I was diving in for more. My roommate and I were splitting the pouch…and we were only going to have a little…but soon we were polishing it off regardless. Morels hit a high note with this one. The spiciness keeps each bite interesting and the taste and texture is dead-on…super good. So, let’s talk nutrition. A pouch of Ned’s Spicy Chipotle Jerky from Morels The Vegan Butcher serves 2.5. In one serving (28 grams/1 ounce), you are served 50 calories and 2 grams of fat. 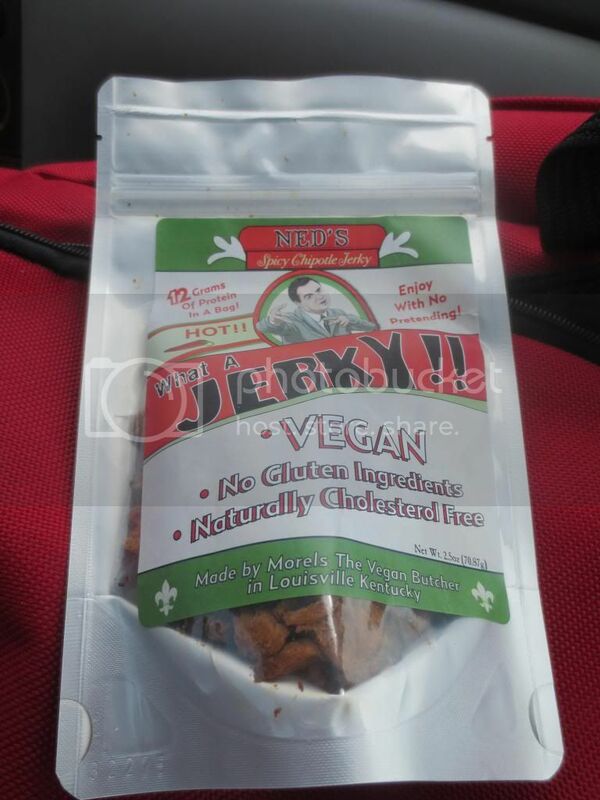 This vegan jerky contains no saturated fat, no trans fat, no cholesterol. It has 370 mg of sodium per serving and only 2 grams of sugar. Each serving provides 2 grams of fiber and 5 grams of protein. Loving it. The Ned’s Spicy Chipotle Jerky variety from Morels The Vegan Butcher brings the right amount of heat to each bite without overpowering and killing off the flavor in the vegan jerky itself. I went wild for this. I wish I had purchased more. But, they are a local company, so it shouldn’t be too hard to dig up another pouch of this amazing snack food. Easy to travel with…and super delicious. Loved every handful. This entry was posted in Clean Eating, Event, Food, Gluten-Free, Local, Products, Review, Snacks, Vegan, Vegetarian by The Celiathlete. Bookmark the permalink. ” I went wild for this. ” – Ohhhhhh – Karen gone wild!